Julian Talamantez Brolaski is poet and singer, the author of two recent chapbooks, COME CORRECT (fivehundred places 2018), and JULIAN (krupskaya 2018), three full length books, Of Mongrelitude (Wave Books 2017), Advice for Lovers (City Lights 2012), gowanus atropolis (Ugly Duckling Presse 2011), and co-editor of NO GENDER: Reflections on the Life & Work of kari edwards (Litmus Press / Belladonna Books 2009). Julian is the lead singer and rhythm guitarist in the country bands Juan & the Pines (NYC) and The Western Skyline (Oakland) (www.thewesternskyline.org), and has sung with the Bay Area American Indian Two-Spirits drum. 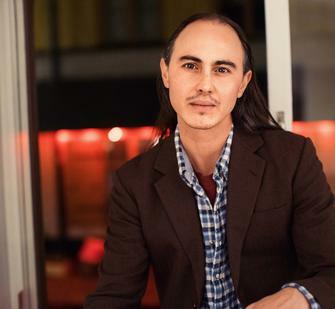 Julian is currently a Literary Fellow at the Lucas Artists Program at the Montalvo Arts Center, researching and editing a book on the Mescalero Apache coming-of-age ceremony. Julian’s work deals with issues of indigeneity, resistance, two-spirit, trans, and mixed-race identity, and the way that language and song function as medicine.